Read Along with Woolly makes bedtime stories even better! Based on the popular CBeebies character, Woolly comes with his own story book featuring four exciting tales. Symbols within each story match with the embroidered symbols on Woolly's feet. 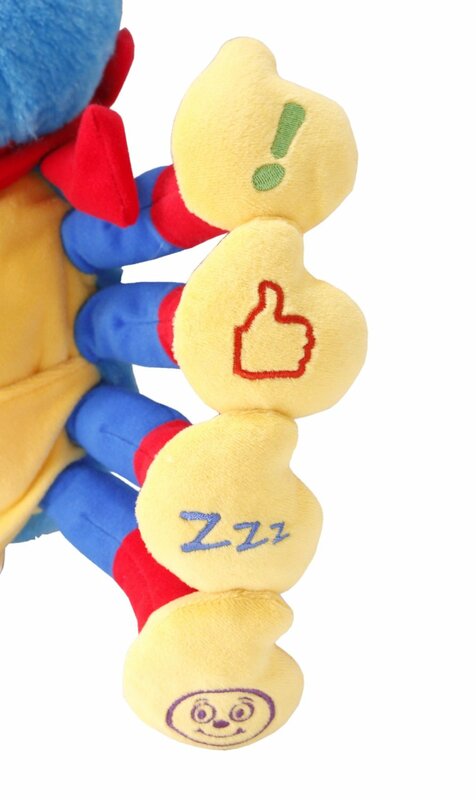 Kids will love to press them to hear fun sounds and phrases. A brilliant way to encourage a love of reading; Woolly's interactive features are bound to delight and entertain your little one. We love Woolly and Tig and we watch it all the time, so when we were offered the Read with Woolly to review we were over the moon. Especially as we are doing lots of reading with the boys at the moment. Kyd's reading age doesn't match his actual age due to his Down Syndrome and the issue with this is that reading materials for his ability, are pretty babyish and patronising. Toys like this that he can read to his brother really help give him a reason to read words of his ability without feeling silly about it. It gives him a bit of dignity back. Rocky was the first to see the brightly coloured cuddly Woolly. Taking him out of the box was pretty easy and he was soon being explored by Rocky's excited little eyes. He soon discovered that each leg had a noisy button on the end and that one sung the song he listened to every day on Cbeebies... which was repeated constantly for a good five minutes whilst laughing. He then realised that the book on the front was in fact a book, so he sat me down to read it. He soon got the hang of the fact that the pictures matched the buttons on Woolly's legs and was finding them ready to press. His favourite story is about bath time, probably because that is his favourite time of day. When Kyd got home, he too sat and played with the squidgy new addition to the house. The only spider I think he would be pleased to see as he walked through the door. He laughed along with Rocky as he showed him each button and he soon was reading the book with him. He found the book entertaining and although he got stuck on a few words he loved the fact that he was reading with his brother... it was beautiful to watch. 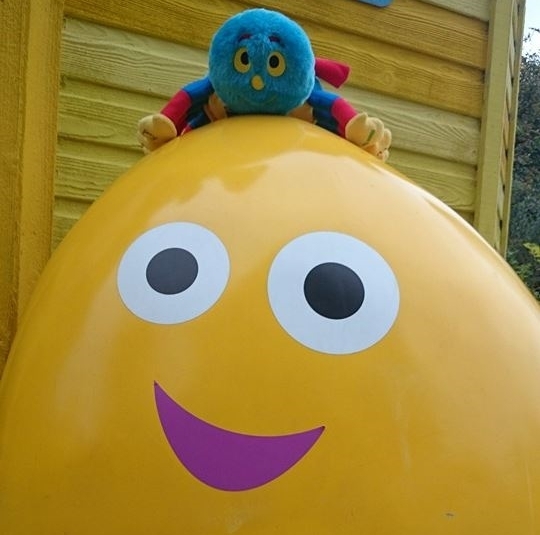 Woolly actually came to Cbeebies Land with us. 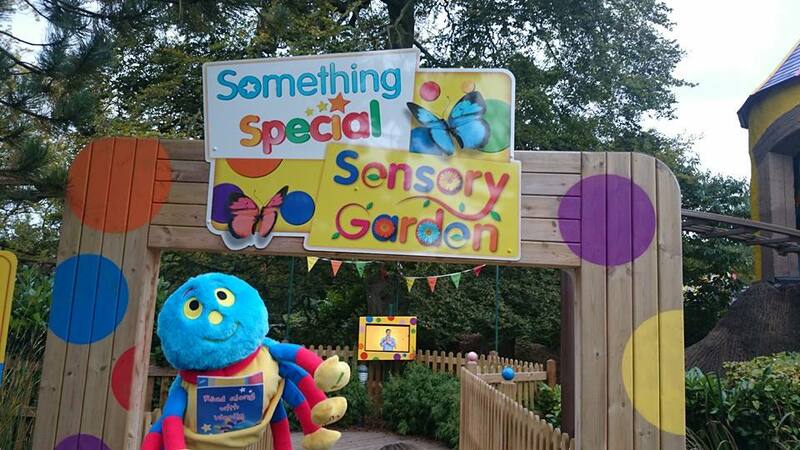 He went to the Something Special garden and the Big Fun Show Time arena. He loved Justin's house and the Tree Top adventure too, he was happy to see all his friends... He did however have a bit of an accident. I think it would make more sense for it to be made from dribble/sick/toddler proof material rather than card, even laminated card would work better as if it is aimed at 10 month olds and over I can imagine it may get chewed a little. Woolly is still ok though and we have bought some books that we can almost fit the phrases of the buttons in with, although it is all a bit strange, it will make for fun reading and he's that cuddly it doesn't really matter.